Have you ever wanted to dig up rocks, give them a classification and then shoot them through a space portal? Yes? Then we’ve got a game for you. The League of Lonely Geologists is a pay-what-you-like game for Windows by a designer named Takorii. It’s similarity to No Man’s Sky is limited to the way you make discoveries and name them. In No Man’s Sky, you discover planets. In The League of Lonely Geologists, you discover rocks... and other things. You can add some notes about the rocks you dig up, and then they belong to you. 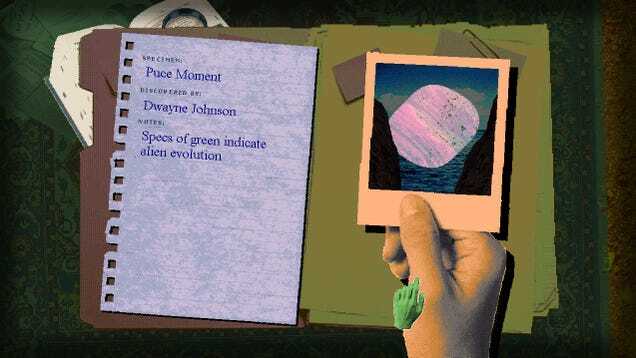 The rocks and notes are then publicly listed in the catalogue along with the user name that you choose at the beginning of the game. Once you dig up a rock, toss it in the space portal at the top of the map and something else will pop out. We don’t want to say much more about what else you do. It’s a simple game that just wants you to experiment with a few mechanics. Plus, you have to love the old school aesthetic. If you’re looking to get (back) into gaming this year but don’t know where to begin, this is a good place to start your journey. Has the Age of Powerful and Convenient Gaming Laptops Finally Arrived? The Asus ROG Zephyrus is an extraordinary laptop that manages to be so thin and powerful that it boggles the mind a little—but it’s also got a very serious flaw. Well, we all saw it coming. Just give up hope now. Life is short.